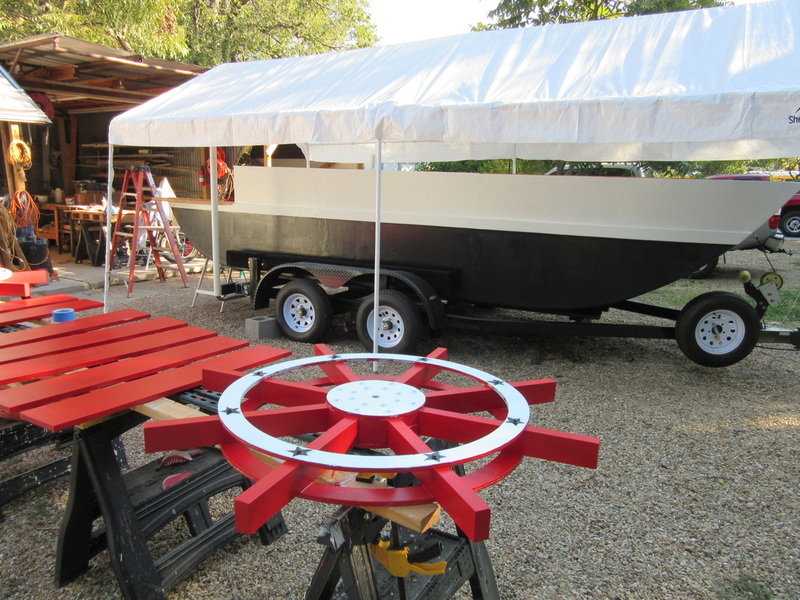 New drawing for paddle wheel. After looking at other boats, I noticed they all had the side circles at the bottom of the paddles. 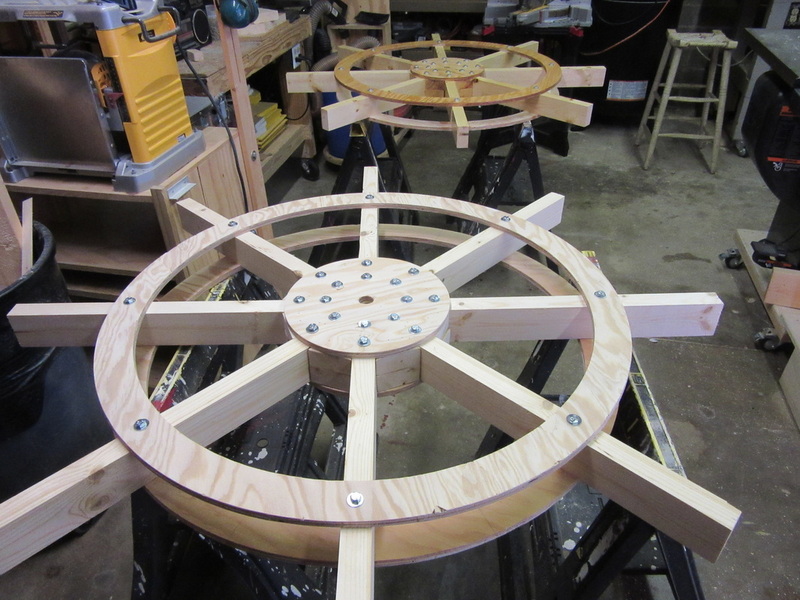 So redrawing the paddle wheel, it did not need the second circle. 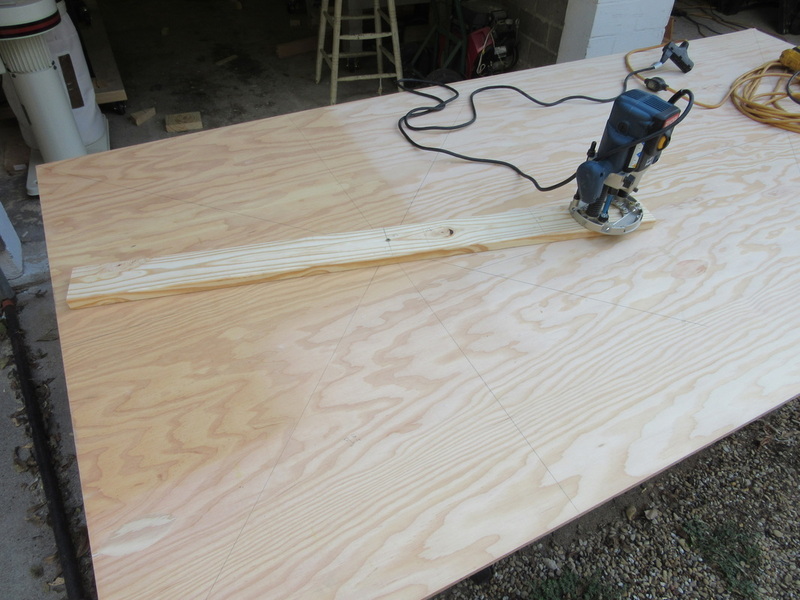 I find the best way to cut a circle is with a router attached to a board. I just mark center locations on the board and I can cut any size circle. 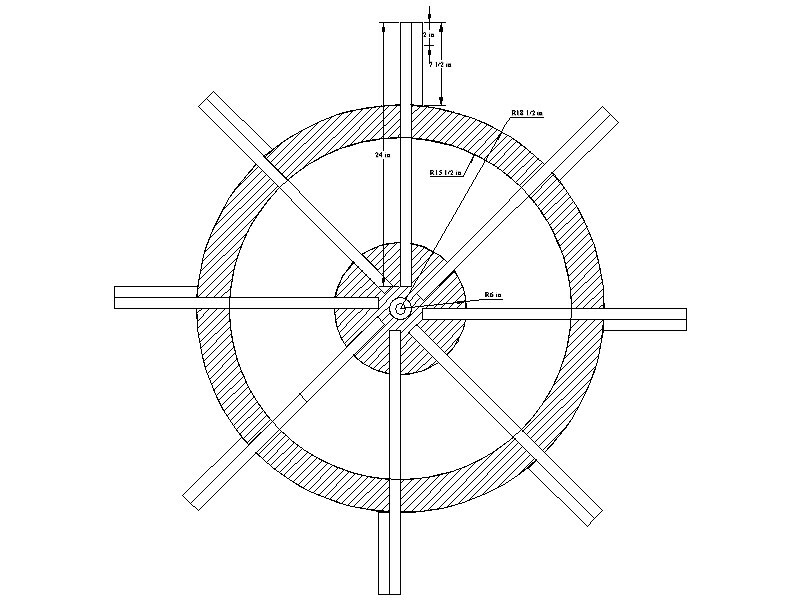 What is funny, after all my drafting and thinking, I realised I forgot to take in the 1/2" thickness of the bit, so my outter ring is just 1/2" thinner on the inside diameter. No worries, ring still 2 1/2" thick which wil still give go support. 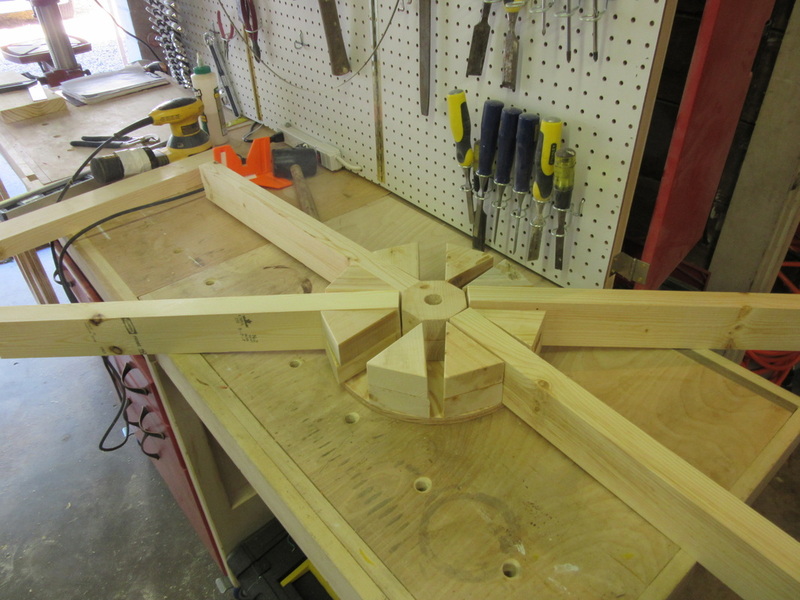 I decided it would be prudent to have a solid hub, so here are the dimentions of the spacers. Below you can see a dry fitting of the spacers. Using scrap 2x4s I cut the spacers and hub pieces out and glued them together. I did not glue them to the outter wheel hub circle yet. 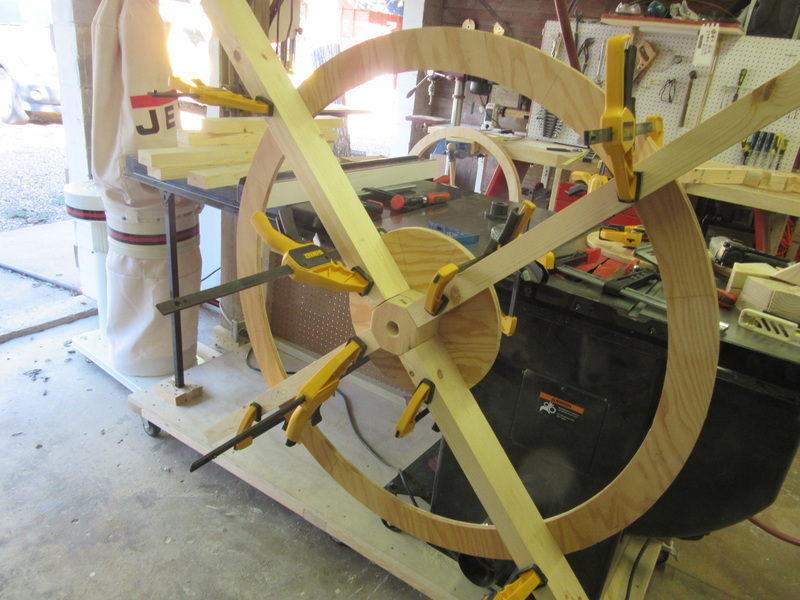 I started with gluing the hub spacer center to the outter wheel hub circle. Here is test fitting the spoke on. Using a triangle I glued the spokes on with 45 degree spacings. I also used a finishing nail gun to help hold the pieces while the glue dried. 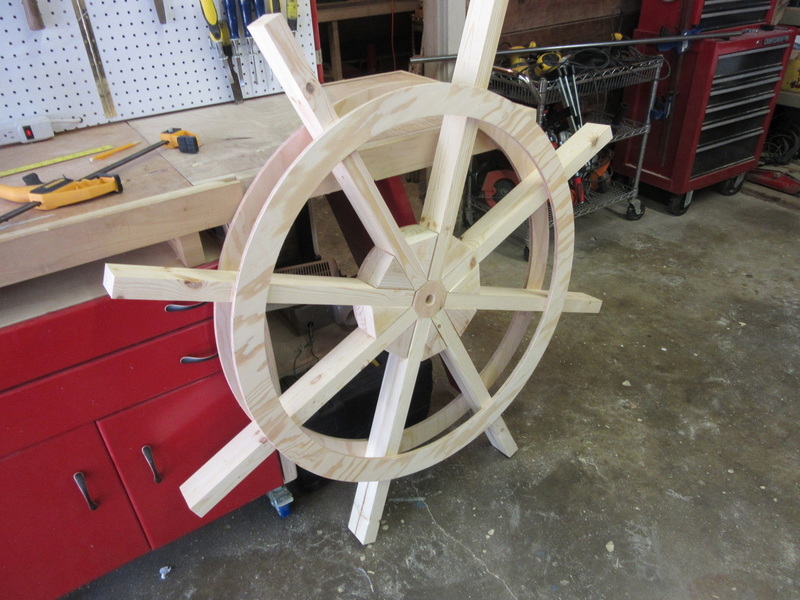 Here is an almost finished wheel. 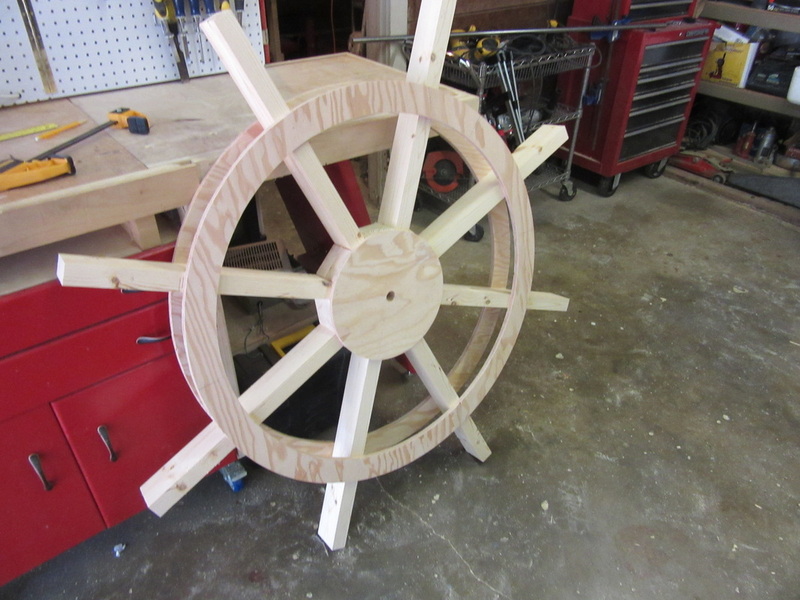 I used lag screws to give the wheel even more strength. Unfortunantly the wheels will have to wait till I get back from the store, for I have run out of lag screws. Need (96) 3/8" dia. 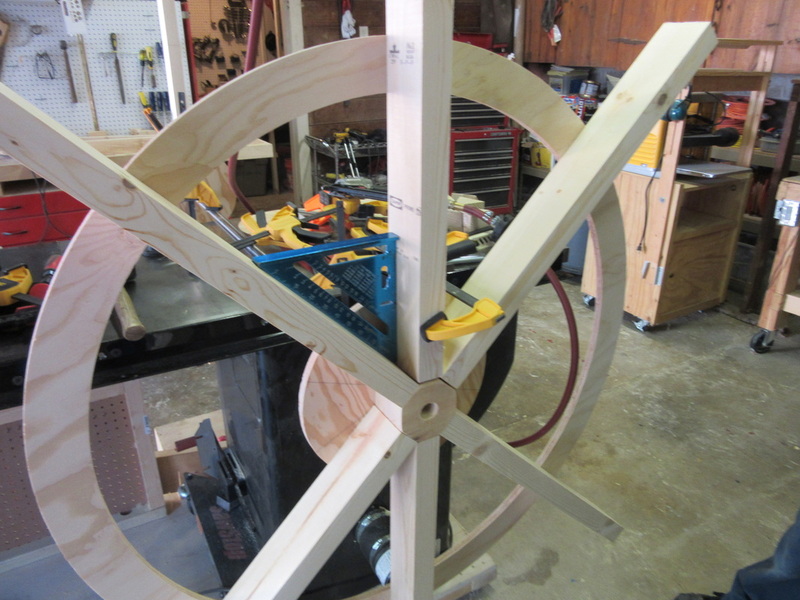 1 1/2" lag screws to do both sides the wheels. 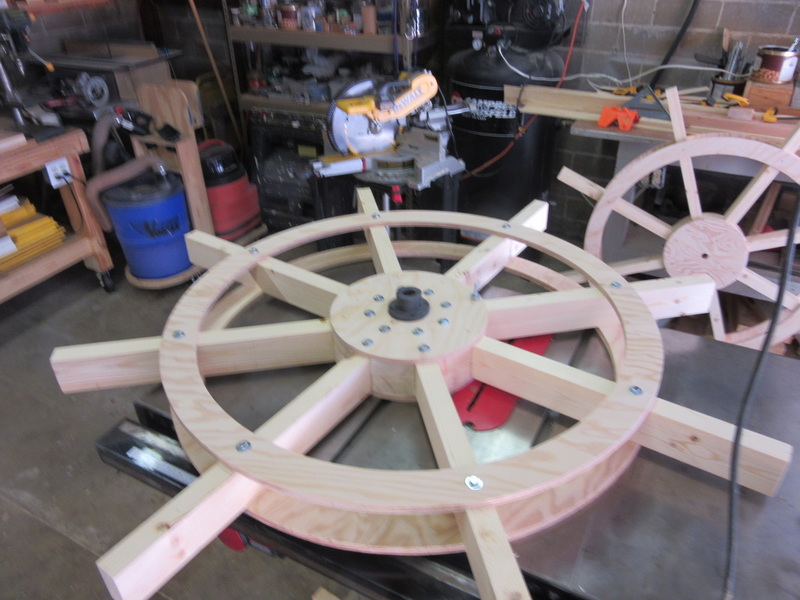 Below the wheels are awaiting a nice sealing coat of resin. One of the main reasons to make the hub solid is that is was very messy and difficult to fit my hand with a brush of either resin or paint through the rings and coat the inside of the hub once built. OH my GOD! I went to Northern to buy a item for the boat trailer and could not locate it. An employee sought to help, but could not find one either, so we went to his computer. Trying to look the item up, we tried many names for the item. It was not till another employee leaned over and said, "Try using an I instead of an E."
Primed the Wheel parts. After sanding, will pant them a nice red with white rings. 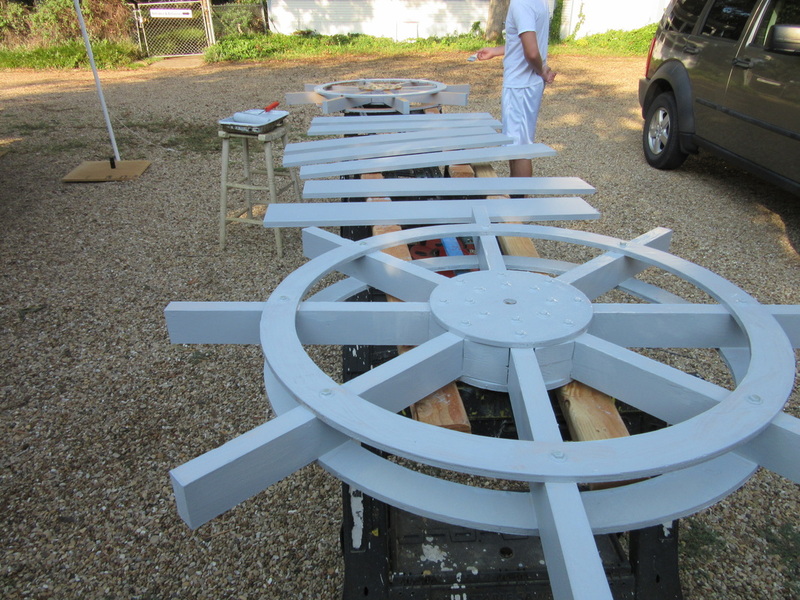 Ah, first coat of paint on the wheel pieces, and getting rest of boat primed. 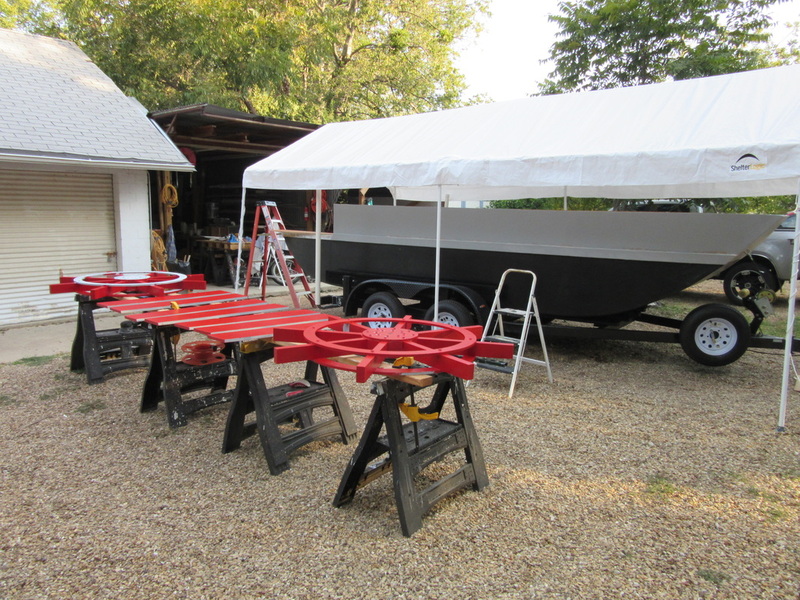 Finally the boat is Painted white. 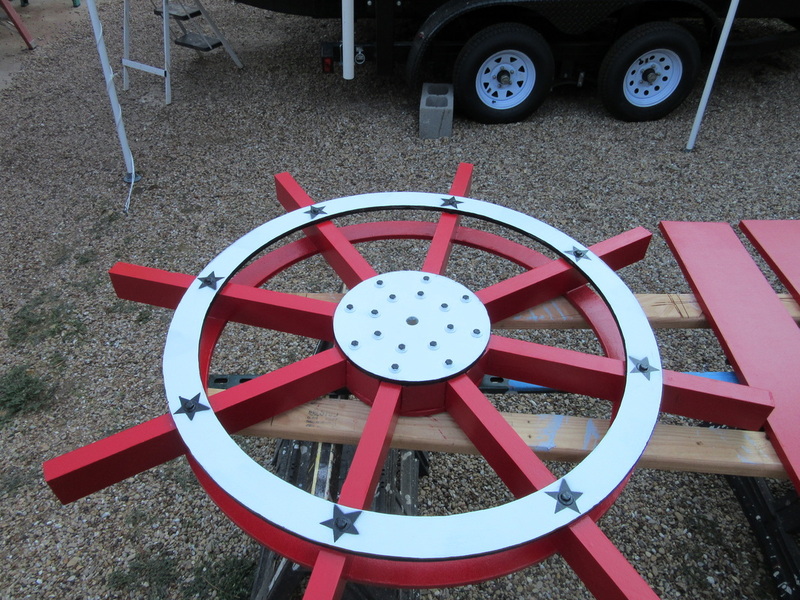 Spray painted on the stars over the outter bolts on the wheel. Wheel is pretty well done. Just needs a few touch ups, once paint dries.